Audi once again has proved that they don’t compromise with the RS7 performance figures. The new release at the 2015 Frankfurt Motor Show, this time is Audi RS7 Sportback Performance 2016. 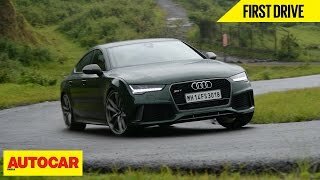 Neither the name neither is new for performance lovers nor is the luxuries offered but before jumping to any conclusion, let us have a look at the review of Audi RS7 Sportback Performance 2016 to know in detail. Top Speed: 155 mph (electronically limited)/174 mph upon request/189.5 mph with dynamic package. The interior of Audi RS7 Sportback Performance 2016 is an unmatched example of luxury and space. The model offers 49.1 cubic feet of cargo space which is way ahead of other cars of this level. Talking about the design, company has loaded the model with specially designed performance Design Package. This package offers you standard sports seats with side bolsters and an integrated head restraint. Model is equipped with Alcantara/leather upholstery featuring black and blue coloring and honeycomb pattern. Buyers will also get contrasting armrests, control elements, and floor maps. There is a leather wrapped flat bottom three-spoke multifunction steering wheel for the driver while a power retractable screen is mounted over the dashboard, serving the infotainment purpose. In all the interior details of Audi RS7 Sportback Performance 2016 with its premium features like the Audi Connect, Wi-Fi hotspot and adaptive cruise control with refined looks through the illuminated entry sills, make the model worth your penny. 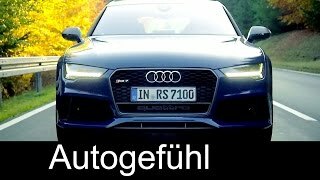 The exterior of Audi RS7 Sportback Performance 2016 has details that complement its interior. Starting with the front fascia, the traditional massive singleframe grille sits proudly amidst the narrow-shaped LED headlights. Beneath this setup large air intakes are housed to deliver some fresh air to its engine and keep it cool. Moving towards the rear end, you’ll notice side-view mirrors trimmed in titanium-look. The same essence can also be noticed over the front spoiler, lateral intake flaps and side windows. The rear end the model gets some smooth design cues that make it look elegant while the exhaust-housing diffuser in bumper adds the touch of sportiveness. Rounding up the exterior details of the model, I would say it is elegant and luxurious with a minute touch of sportiveness. 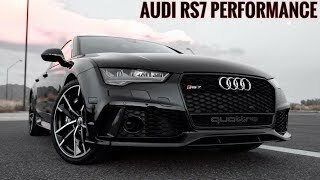 Rolling the massive 21” cast aluminum wheels of Audi RS7 Sportback Performance 2016 is a 4.0 Liter TFSI engine cranking total output of 605 hp and peak torque of 700 nm. The torque can be further exceeded to 750 nm with Overboost feature. The top speed of Audi RS7 Sportback Performance 2016 is electronically limited to 155 mph but buyers can get it to 174 mph upon special request. Not only this, there is also a dynamic package which further takes the top speed figure to 189.5 mph. The 0-62 mph sprint can be knocked in just 3.7 seconds.